My Fort Meade listening post has picked up strong signals that 2016 promises to be a crucial year in the development of U.S. Cyber Command. “You can tell we’re at the tipping point now,” said Admiral Michael S. Rogers, the commander of CyberCom and director of the National Security Agency, speaking Thursday at the Atlantic Council. The 6,200-strong CyberCom force is beginning to jell into a major, cohesive national asset. “The capacity and capability is starting to come online. The hard work of the last few years is really starting to pay off in some really tangible capabilities that you will see us start to apply in a broader and broader way,” Rogers said. Despite the lingering trust deficit stemming from the controversy over its domestic and international electronic surveillance activities, the NSA continues to attract and retain the best cyber talent the country has to offer. In fact, the agency’s retention rate in 2015 was a staggering 96.7 percent. Meanwhile, its attrition rate for high-end science, technology, engineering, and mathematics (STEM) professionals was less than 10 percent. But those “phenomenal” statistics come with a downside—recapitalizing the workforce at that rate will take NSA 30 years. That is the driver behind the NSA’s effort to create a partnership program with private companies to share cyber talent, said Rogers. The Department of Homeland Security’s effort to create a biometric exit system to monitor and report foreign nationals who overstay their visas or temporary visitor status remains woefully behind schedule. In fact, the department has missed multiple statutory deadlines during the last few years and does not appear to be picking up the pace in 2016. A biometric entry tracking system has been fully operational at U.S. airports since 2006. But a corresponding exit system—required by law since 2004—remains out of reach more than a decade later. My border crossing surveillance outpost reports that the department still hasn’t delivered a single data point on overstays by foreign nationals and has yet to document the reliability of the data it does have. In addition, the agency still has not identified a way to collect data on individuals exiting the country through southern land border crossings. Technologists at U.S. Customs and Border Protection (CBP) continue to plan and analyze how proposed biometric technologies will integrate with existing CBP systems, according to reports. Perhaps DHS should ask the European Space Agency for help. How hard can capturing fingerprints be after you’ve landed a spacecraft on a comet hurtling through space? DHS may not be able to count and track visa overstays, but at least the Transportation Security Administration has a handle on the number of weapons people are trying to smuggle onto airplanes every year. 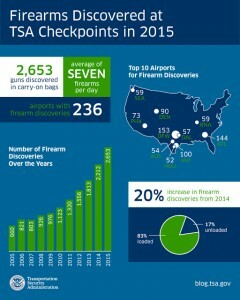 Last year was a record-setting year for intercepting guns in carry-on luggage, with TSA officers stopping 2,653 firearms before their owners could get them aboard aircraft. Of the weapons confiscated at 236 airports around the country, 83 percent were loaded.